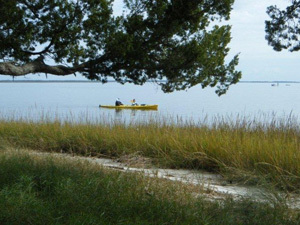 Whether by canoe or kayak, paddlers will enjoy the diverse natural environment of the wide Suwannee River, (remove deep) fresh waters creeks, winding salt water sloughs and placid, shallow near-shore Gulf waters, all with easy access. 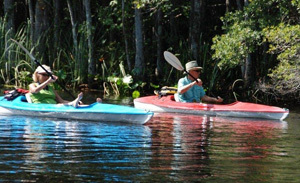 For best novice or family paddling, launch in the town of Suwannee at Anderson Landing State River Camp, the community center, Munden Creek, or one of the public boat ramp. Hire a guide or choose to explore on your own. With some experience you can follow one of the interlocking trails marked by the U.S. Fish and Wildlife Service on unobstructed creeks. For a 2 - 4 hour trip, paddle the winding creeks of Demory, Locke or Shingle into the Suwannee River. Beyond the marked trails, only experience, energy, weather, and tides need limit your paddling adventure. 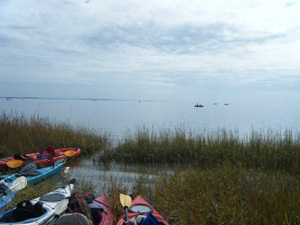 In East Pass, a meander to the Gulf is a 4 mile paddle. You will see the hardwoods give way to marsh. Watch for rolling garfish, jumping sturgeons and osprey wheeling over untidy nests high in giant cypress. Yes, you may see an alligator or two, but they usually want nothing to do with humans. Paddle the broad Suwannee to West Pass and watch sunset transform the world to gold. If the weather is good, take a day paddle to some of the area islands. You can pick through the shallow water and oyster bars or follow secret sloughs between walls of water grass. Tides affect the Gulf and estuaries of the Suwannee River and the currents are strongest when the river is low. Very shallow tidal creeks may trickle down to nothing at ebb tide. For best paddling, consult a tide chart and plan in advance to take advantage of ebb and flow. The "low energy" coastline, the slow flowing river, and the moderate temperatures make Suwannee the perfect place to paddle all year. Always be aware of the tides and the winds. 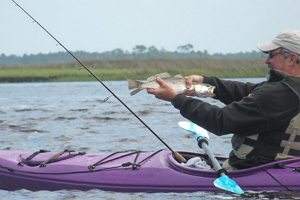 Rental of kayaks, canoes, and related equipment is available from local full service outfitters. 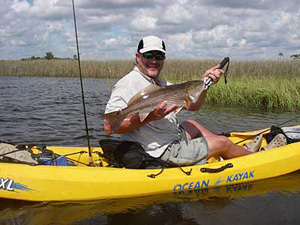 Because great fishing is so close to shore, and there are many areas too shallow for motor boats, kayak fishing is a great sport for this area. 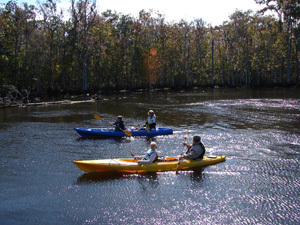 If you enjoy the adventure of longer paddling trips, drive to Suwannee and let our outfitters shuttle you to the beginning of the Big Bend Paddling Trail, the Suwannee River Wilderness Trail, or a custom weekend or day trip. So many avid paddlers will claim that this area is some of the very best paddling in the world- yes - the world! For those of you not acquainted with the Hidden Coast of Florida it's also known as the Big Bend and is in the bend of Florida on the northern Gulf of Mexico side seen in the picture above. The flow of water in this area is very different from the rest of Florida and has, over eons, built up a shoreline unlike anything else there is. Explore the world-class paddling and wildlife viewing opportunities the Hidden Coast offers along Florida’s Big Bend’s waterways, trails, and slow-paced back roads.